Amazon just kicked off another Gold Box deal full of Logitech peripherals, and this one is a doozy. 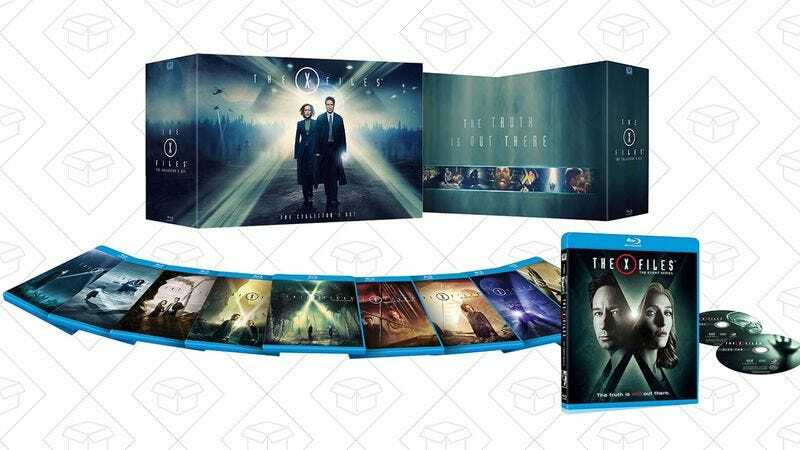 The complete X-Files Collector’s Set is backed with 57 (!!!) discs making up all 10 seasons (including the new special event series from 2016), plus over 25 hours of extra features. If you’re a die-hard fan, Amazon’s selling the set for $120, matching an all-time low price. If you preorder the Taken 3-movie collection for an all-time low $15 now, that’ll be the end of it. I will not look for you, I will not pursue you. But if you don’t, I will look for you, I will find you, and I will scold you. If you still haven’t recovered from 2016’s O.J. fever, his pseudo-confessional book is down to $1 on Kindle today. This new edition includes essays from the Goldmans and their attorney detailing the O.J. Simpson bankruptcy case, which resulted in the family obtaining the rights to this very book. It’s all very meta. I can’t promise that buying Rocket League Collector’s Edition (which comes with a ton of downloadable content) will lead to a job with Shaquille O’Neal and thousands of dollars in prize money. But I can promise that you’ll have fun. $15 is the best price Amazon’s ever listed on the PC version. This Contigo travel mug is very similar to the Autoseal West Loop, your overwhelmingly favorite mug on Kinja Co-Op, but with a rubberized non-slip grip. $14 matches a Gold Box deal from last week, so if you missed out on that all-time low price, this is a great second chance. A pistol grip handle can help you steady your hand when shooting with a digital single-lens reflex camera, GoPro, smartphone (with adapter), or any camera in between, and you can add one to your bag for $15 today. So you want to try a standing desk, but you’re not ready to commit to it for eight hours a day? What do you do? You buy this Lorell monitor riser for $148, an all-time low. This riser arrives fully assembled and just sits on top of your existing desk. Put your monitor(s) on the top shelf, your keyboard and mouse on the bottom, and use its integrated spring system to raise the entire setup from a sitting to standing position within seconds. I own a very similar product from Varidesk (which was much more expensive, by the way), and I absolutely love it. I can tell you from experience that you’ll definitely want a good anti-fatigue mat for standing. This one has great reviews, but whatever you choose, make sure it’s at least 3/4” thick. If you have any trips on the horizon, this inflatable pillow can make that economy class seat just a little bit less terrible. Inflatable pillows are a dime a dozen, but this one is shaped in such a way to provide more support if your head nods backward or off to the side when you doze off, and it comes with a carrying case to boot. If you struggle with manual wine openers, or just need an easy gift idea for someone, Oster’s top-selling electric wine opener is just $16 today, complete with a foil cutter.